A few weeks in, Justice League Action has already given DC fans a lot to smile about: obscure characters making appearances, lots of Easter eggs, and some spot-on casting, including the return of Kevin Conroy as Batman and Mark Hamill as The Joker. They've also delivered a smiling, "classic" take on Superman that gives longtime fans, many of whom have expressed frustration with the darker, more "gritty" Superman of the DC Extended Universe, a chance to see "their" version of the character onscreen. "When I first auditioned for this, I was really trying to find something new. We've seen so many different narrations of Kal over the years that it's hard to know if I'm going to be able to bring something fresh," actor Jason J. Lewis, who plays Superman on the show, told ComicBook.com. "What I realized when I was auditioning was that the way they wrote the specs we auditioned was such that they welcomed everyone to audition, but they wanted to bring something fresh and new and interesting but really play up the fact that he was the Kansas farm boy at heart, a boy scout and just a really pure spirit. So I really began to focus on that and think, 'Gosh the quality of my voice and who I am as a person and all these things are very close.' I'm also adopted. Superman is someone that I have a identified with in some ways in my life in the sense that he's felt a little outcast, his felt a little out of place. This isn't his home but his parents love him and are trying very hard to make him feel like he's one of them even though he realizes that he's made for so much more. That's sounds like a lot to pack into a voice acting performance, but I really believe that even as a voice actor, you really want to bring that same essence to what you're doing. I really tried to focus in and bring the voice as close to what would sound as natural to me as possible rather than try to put on a voice to sound like something tough or phony because the reality is the Kal we know is humble and confident and does have a bit of a wink and a smile and doesn't take himself seriously -- but takes what he does seriously." Calling the character "Kal," of course, sounds like it comes out of a story like Kingdom Come or perhaps the Silver and Bronze Age comics where Krypton played a major day-to-day role in Superman's life. Mostly, we pointed out, he's been "Clark" ever since the John Byrne reboot 31 years ago. "I think Clark is exactly who he is," Lewis assured us. "I think I like to reference him as Kal because I think there's a part of him that yearns for home. He's always looking for his place in this world but I think he very much embraces Clark and who he is, by in Justice League Action, he is more Kal than he is Clark in the sense that we see more of him Superman than we do as Clark Kent." And how, exactly, does one manage to reflect Superman's Midwestern roots and gentle nature in a series where the word "Action" is in the title and audiences will rarely get a chance to see him out of costume? It all comes down to what happens before and after the action. "Superman wants to see the best in everybody. Even in the criminals he catches, he wants to find a way to rehabilitate them or help them and treats them with respect as much as possible," Lewis said. "You see it in the premiere with Parasite, when he's saying how he's still a person, he's still was a being that had life and you need to respect that. thought that that was a really important thing and I like that the writers captured that." 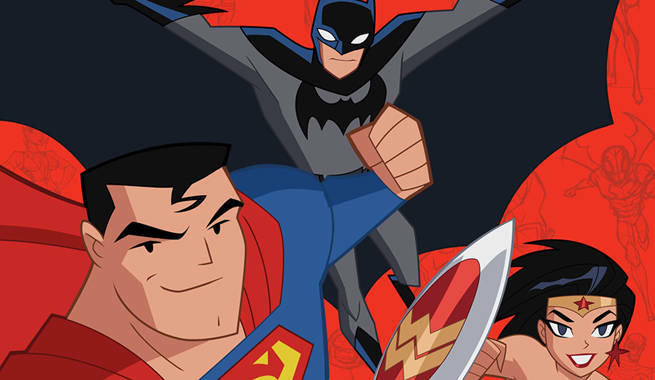 Justice League Action airs Saturday mornings at 7:30 a.m. ET/PT on Cartoon Network.